Infant mortality refers to deaths of children under the age of one year. It is measured by the infant mortality rate, which is the total number of deaths to children under the age of one year for every 1,000 live births. The infant mortality rate is often broken down into two components relating to timing of death: neonatal and postneonatal. The neonatal mortality rate refers to the number of deaths to babies within 28 days after birth (per 1,000 live births). Sometimes a special type of neonatal mortality is assessed. The perinatal mortality rate measures the number of late fetal deaths (at or after 28 weeks gestation) and deaths within the first 7 days after birth per 1,000 live births. The postneonatal mortality rate involves the number of deaths to babies from 28 days to the end of the first year per 1,000 live births. The distinction between neonatal (and perinatal) and postneonatal mortality is important because the risk of death is higher close to the delivery date, and the causes of death near the time of birth/delivery are quite different from those later in infancy. Therefore, effective interventions to reduce infant mortality need to take into account the distribution of ages at death of infants. Many developing countries lack the resources to keep track of infant deaths; therefore data for these areas are estimates only. Another methodological problem in measuring infant mortality is ascertaining the number of live births. Sometimes this problem is one of undercounts of births (i.e., births are not registered and thus not counted); sometimes the difficulty lies in inconsistently differentiating stillbirths and live births, especially across countries because this distinction is not as clear-cut as one might imagine. Table 1 provides infant mortality rates for the world, for developed and developing countries, and by continent, with some selected countries that highlight the range of levels. At 57, the world's infant mortality rate has never been lower; however, differences across the world are substantial. Africa's rate (88) is ten times higher than the average rate (8) for the developed countries. Within Africa the highest levels of infant mortality in the world are experienced, with rates as high as 157 in Sierra Leone. On average the rate for Asia (56) is somewhat lower than for Africa, but some Asian countries such as Afghanistan have rates (150) as high as anywhere in the world. On the other hand, Hong Kong's rate (3.2) is very low, illustrating that the most variation in infant mortality level occurs in Asia. Both Europe and North America (the United States and Canada) have low levels of infant mortality, with average rates well under 10. However, European variation is not inconsequential; rates in at least some parts of Eastern Europe are nearly 10 times higher than in northern European countries such as Iceland and Sweden. SOURCE : Population Reference Bureau. 2001 World Population Data Sheet. Washington, DC: Population Reference Bureau, 2001.
conditions in a country. Richer countries can provide the basic ingredients for infant survival: clean water, sanitary surroundings, adequate food and shelter, and access to health care services. A large portion of infant mortality is due to infectious and communicable diseases, which sanitary practices and an adequate diet do much to prevent. At the individual level mothers (and fathers) with higher income and education are more likely to possess knowledge of sanitary behaviors and the money for adequate food, as well as to take their babies to a health service if needed. Especially important in the latter regard is oral rehydration therapy, which is effective in saving babies from dying from the dehydration that accompanies diarrhea. Postneonatal mortality is most often caused by infectious diseases, such as pneumonia, tetanus, and malaria. An important factor in reducing post-neonatal mortality is adequate nutrition, particularly breast milk, which provides babies with both the nourishment and the antibodies to fight infectious diseases. Of course adequate breast milk depends upon adequately nourished mothers. Also important is the proper use of breast milk substitutes—mixing formula with unclean water and/or diluting formula for cost-savings reasons, both known to occur in developing countries, have negative affects on the health of infants. The promotion by multinational corporations of breast milk substitutes to women in poorer countries has been one of the travesties of our times; it is estimated that 1.5 million deaths a year could be prevented by breast-feeding. The issue of HIV-infected mothers' breast-feeding has become controversial. A number of countries have instituted policies that recommend that mothers with HIV (human immunodeficiency virus) not breast-feed, based on some evidence of mother-to-child transmission of HIV through breast-feeding. In contrast are policies that promote breast-feeding in areas with high HIV prevalence. Because breast-feeding protects against the infectious diseases that take the lives of millions of infants every year, there is policy debate about the best course of action. Researchers do not know if the protection against infectious diseases afforded by breast-feeding outweighs the risks of HIV transmission to children, so it is not possible to make a definitive conclusion about the risks and benefits of breast-feeding by mothers with HIV. However, a 2000 study by the World Health Organization (WHO) Collaborative Study Team on the Role of Breastfeeding on the Prevention of Infant Mortality determined that the breast-fed babies of mothers with HIV had six times the protection against diarrheal deaths in the first few months of life than babies not breast-fed. In the second half-year of life, protection against both diarrheal and acute respiratory infections was about double that for non-breast-fed babies. Protection declined with age of child, and was greatest for the children of the least educated women. It appears the benefits may out-weigh the risks for limited (in time) breast-feeding and for poorer women, who are unable to afford safe substitute milk substitutes. However, another issue to consider is that breast-feeding may negatively affect the health of mothers with HIV/AIDS (human immunodeficiency virus/acquired immunodeficiency syndrome). Another cause of infant mortality is violence. Research conducted in two areas in India show that wife beating, closely linked with patriarchal social structures, leads to both pregnancy loss and infant mortality. Other violence, such as infanticide, the deliberate killing of infants, is extremely difficult to document, but it seems likely that some portion of the "missing girls" in India and China were the victims of infanticide. When infanticide is practiced, it is most likely a response to difficult economic circumstances (and coercive population policy, in the case of China) in conjunction with male-child preference. Violence against babies is not limited to developing countries. Violence to infants in the form of head trauma, including shaken baby syndrome (SBS), has been studied in America. In 2000 the researchers Suzanne Starling and James Holden found that in both a western and southern U.S. sample men are more likely (70 percent) to be perpetrators of violence, with biological fathers (not necessarily married to the mother or living with the child) the most likely to cause fatal (and nonfatal) head trauma to infants, followed by boyfriends. The victims were more likely to be boys, with an average age of six months. Excluding violence, neonatal mortality (in contrast to postneonatal mortality) is less likely to be the direct result of social, economic, and environmental conditions. Major causes of neonatal mortality include low birthweight, preterm (premature) birth, congenital malformations, and sudden infant death syndrome (SIDS). In developed countries most infant mortality is concentrated in the early neonatal period, with the aforementioned causes of death predominant. Over the course of the twentieth century, each developed country has a somewhat unique trend in the timing and tempo of infant mortality decline, an examination of the American case provides a general sense of the Western pattern. In the early part of the twentieth century, the infant mortality rate was in excess of 100—much higher than in the developing countries (on average) of the twenty-first century. In other words, more than 10 percent of children born died in the first year of life. In the earlier stage of decline, postneonatal mortality was reduced. Over the period from 1915 to around the end of World War II, postneonatal mortality experienced a steady and dramatic decline to a level of approximately 10 (Wegman 2001). At the same time, deaths of babies from 28 days to one year of age decreased as a proportion of total infant deaths (i.e., all death under the age of one). This decline was due to improvements in nutrition and in public health, such as clean drinking water, sewage disposal, and personal hygiene. Deaths due to diarrhea and infectious diseases such as pneumonia, diphtheria, and typhoid fever were reduced dramatically. In the post–World War II era, vaccines and other medical interventions such as antibiotics played a role in further declines. Neonatal mortality declined more slowly and later than postneonatal mortality. It was not until around 1975 that the neonatal rate reached 10—lagging behind neonatal mortality by a generation. Neonatal mortality decline is much less dependent on nutrition and public health measures; rather, it requires more sophisticated medical interventions, especially to keep low birthweight babies alive. In the twenty-first century, approximately two-thirds of all infant deaths occur in the neonatal period, with the leading causes of death associated with low birthweight, congenital malformations, and SIDS. The latest data available reveal that the United States' rate for infant mortality is not as low as one might expect. According to the Population Reference Bureau, its rate of 7 is surpassed by several European countries (Denmark, Iceland, Finland, Germany, Netherlands, Switzerland, and the Czech Republic all have rates under 5), several Asian countries (Singapore, Hong Kong and Japan all have rates under 4), Canada (5.5), Australia (5.3), and New Zealand (5.5) (Wegman 2001). Countries in the 7 to 8 range in infant mortality, along with the United States, include Cyprus, Malaysia, and Cuba—all considerably less developed than the United States. The United States' comparatively poor ranking in infant mortality has led to concern at the national level, especially relating to racial inequalities. The figures for African Americans show a consistent disadvantage in infant mortality, a disadvantage that is increasing, especially with regard to neonatal mortality. An important factor influencing the relationship between race and infant mortality is birth-weight. At the end of the twentieth century, 13 percent of (non-Hispanic) African-American babies were born in the low birthweight category (under 2,500 grams or approximately 5 pounds), compared with approximately 6.5 percent of (non-Hispanic) Caucasian babies and Hispanic infants. The reasons why African-American women are so much more likely to give birth to high-risk, low birthweight infants remain unclear, although differences in prenatal care may be implicated, as may the absence of a national health care system and inadequate social welfare. Another factor to note is that the infant mortality of whites is lowered by the contribution of immigrants who have lower infant mortality than the native born. In the decade of the 1990s, Caucasian women (and American Indian and Asian/Pacific Islander women) experienced some increase in low birth-weight babies. This statistic has been attributed in part to an increase in multiple births (e.g., twins, triplets), which are more likely to be low birth-weight newborns. Increases in multiple births are associated with fertility drugs and reproductive technologies such as in vitro fertilization and, to some degree, later age at childbearing. This increase in low birthweight infants does not bode well for future declines in neonatal mortality. In developing countries considerable progress against infant mortality, especially postneonatal mortality, can be accomplished through the implementation of basic public health measures that will reduce infant deaths due to diarrhea and infectious disease. However, the HIV/AIDS epidemic places some countries, especially sub-Saharan Africa and parts of Southeast Asia, in a difficult position since HIV/AIDS kills infants directly and, through lowering immune functioning, indirectly. In developed countries, the major immediate challenge is to reduce the proportion of low birthweight infants. While improved prenatal care will advance that goal, restructuring (i.e., dismantling) of welfare states presents a possible barrier, as does the continuing popularity of technologies to increase fertility. Another unknown factor in all countries is the future role of re-emerging old and emerging new viruses and pathogenic bacteria; these microbes could significantly increase postneonatal mortality. Coale, Ansley J. "Excess Female Mortality and the Balance of the Sexes." Population and Development Review 17 (1991):517–523. Guyer, Bernard, Mary Anne Freedman, Donna Strobino, and Edward J. Sondik. "Annual Summary of Vital Statistics: Trends in the Health of Americans During the 20th Century." Pediatrics 106 (2000):1307–1317. Hummer, Robert A., Monique Biegler, Peter B. DeTurk, Douglas Forbes, W. Parker Frisbie, Ying Hong, and Starling G. Pullum. "Race/Ethnicity, Nativity, and Infant Mortality in the United States." Social Forces 77 (1999):1083–1118. Jejeebhoy, Shireen J. "Associations Between Wife-Beating and Fetal and Infant Death: Impressions from a Survey in Rural India." Studies in Family Planning 29 (1998):300–308. Kposowa, Augustine J., and Pamela J. Preston. "Linking Racism to Birth Weight Disparities in the United States." Research in Social Stratification and Mobility 16 (1998):181–224. Kramer, Michael S., Kitaw Demissie, Hong Yang, Robert W. Platt, and Reg Sauvé. "The Contribution of Mild and Moderate Preterm Birth to Infant Mortality." Journal of the American Medical Association 284 (2000):843–849. Lewis, Michael. "A Path Analysis of the Effect of Welfare on Infant Mortality." Journal of Sociology and Social Welfare 26 (1999):125–136. Liston, Robert. "The Contribution of Mild and Moderate Preterm Birth to Infant Mortality." Journal of the American Medical Association 284 (2000):843–849. Newell, Marie-Louise. "Does Breastfeeding Really Affect Mortality among HIV-1 Infected Women?" Lancet 357 (2001):1634–1636. Population Reference Bureau. 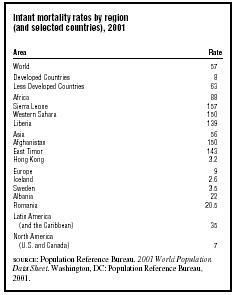 2001 World Population Data Sheet. Washington, DC: Author, 2001. Sen, Amartya "Missing Women." British Medical Journal 304 (1992):587–588. Starling, Suzanne P., and James R. Holden. "Perpetrators of Abusive Head Trauma: A Comparison of Two Regional Populations." Southern Medical Journal 93 (2000):463–465. Wegman, Myron E. "Infant Mortality in the 20th Century, Dramatic but Uneven Progress." Journal of Nutrition 131 (2001):401S–408S. Wise, Jacqui. "Baby Milk Companies Accused of Breaching Marketing Code." British Medical Journal 314 (January 1997):167–169. World Health Organization Collaborative Study Team on the Role of Breastfeeding on the Prevention of Infant Mortality. "Effect of Breastfeeding on Infant and Child Mortality Due to Infectious Diseases in Less Developed Countries: A Pooled Analysis." Lancet 355 (2000):451–455.